As Willie Walsh has disassembled British Airways, he's also decided to swap in low-end Level for high-quality OpenSkies, the boutique BA division that flies between New York/Kennedy, Newark and Paris/Orly. OpenSkies dies forever on September 2, but BA needs to keep the planes full. And the best bargain is in the airline's premium economy, which offers a 2x2 configuration and 47 inches of legroom. The price for those truly comfy seats? As low as $827 roundtrip. How cheap is that? It's less than Norwegian Air is charging for its premium cabin--and it's even cheaper than the $1,000 introductory roundtrip fare OpenSkies posted when it launched in 2008. Availability at that specific price is spotty, but there are plenty of days with sub-$900 roundtrips and many more in the $900-$1,000 roundtrip range. There may always be a Paris, but there won't always be an OpenSkies--or fares this low. Information: the OPENSKIES home page. Accor, the gigantic global hotel chain based in Paris, is back with another promotion: 3 nights for the price of 2 at about 2,000 of its hotels. Valid stay dates are March 31 to June 10 if you book and pay by April 3. As always with these promotions, compare standard rates and special deals to the 3=2 rate. Why? Because there is never a guarantee that a promotion of this type will yield the lowest price. Information: the Accor STAY 3, PAY 2 page. Coach fares to Europe this spring remain at historic lows. So where does that leave premium economy cabins? At fare levels around where coach once sold. Lufthansa, for example, is now around $1,350 roundtrip for its premium economy, which offers 38 inches of legroom, footrests, upgraded meals and other perks. That fare is only on one route--New York/Kennedy to Lufthansa's Frankfurt hub--but other runs are being offered at equally low rates: Chicago-Budapest for $1,499 roundtrip; Miami-Florence for $1,649; and San Jose-Frankfurt for $2,089. You must hurry: Tickets must be purchased by March 29 for departures by May 10. The cheapest prices are for midweek travel, of course, and weekend surcharges are about $100 each way. A Saturday stay and 7-day advance purchase are required. Information: the EXPERIENCE PREMIUM ECONOMY page. Choice's lightly regarded Choice Privileges program is once again rolling out the heavily restricted two-earns-one promotion. For two separate stays between April 2 and May 25, you'll receive enough points to claim a free night at about a thousand of Choice's properties. There are lots of gimmicky rules and nasty restrictions (not to mention advance registration), so read carefully before you commit. Information: the BOOK. STAY. REPEAT. page. Mileage earning from car rentals has had a strange history. In the early days of the frequency programs, they were gushers of cheap miles. Then the car rental firms realized they were paying plenty to the airlines for miles without moving the market since all the companies were doing the same thing. So for decades car rentals were earnings deserts. Lately, however, the airlines and rental firms have been working out relatively exclusive deals. The latest example? Avis/Budget will give you 500 American AAdvantage miles for a three-day rental. Still, that's not as good as the 1,000-mile offer that existed through most of last year. This deal is valid for rentals that begin by April 1. Information: the CAR PROMOTIONAL OFFERS page. The CircaTerra offer: Receive 15% off the price of all travel products and luggage, including sale prices. How to claim the offer: Enter promo code JoeSentMe in the Gift Certificate or Coupon Code box on the order confirmation page when you shop at CircaTerra Travel. Cook Travel Offer: 10% off most published base fares on SkyTeam international business tickets. 5% off on Star Alliance international business or first class tickets. Upgrades on most airlines when available to business from full-fare international coach. How to claim offer: Call 800-435-8776. Identify yourself as a JoeSentMe member. The ECBC Offer: 30 percent off all ECBC luggage purchases and free shipping except for clearance items. How to claim the offer: Enter the code JOESENTME in the promo code box on the checkout page when you shop at http://www.ec-bc.com. The Groundlink Offer: Receive 20 percent off rides when you book them using the GroundLink app. How to claim the offer: Download the GroundLink app from the Apple or Android stores or GroundLink.com. Enter JOESENTME in the promo code box that will appear on the screen before you confirm your ride. The Sheffield Spice & Tea Offer: Receive 15% off all purchases of spices, teas, rubs and accessories. How to claim the offer: Surf to http://www.sheffieldspices.com and, when you reach the shopping cart page, enter joesentme2018 in the coupon code box. Fairmont is offering 10 to 30 percent off all properties, which range from hotels throughout Canada to trophy properties in the Caribbean and a grab bag of U.S. luxury locations. President's Club members also receive an additional 10 percent off. Jump on this before Fairmont is fully co-opted by Accor, its new parent company. Use discount code PRLL. Book by April 6 for travel until April 30. Information: the STAY LONGER. STAY MORE. page. Hyatt has serially shot itself in the foot ever since last year's replacement of Gold Passport with World of Hyatt. The latest promotion isn't much of a bandage, but I suppose it is better than another self-inflicted wound. Until May 15, you will earn 1,000 bonus points per night at full-service Hyatt-branded properties and 500 points per night at the more numerous Hyatt Place and Hyatt House hotels. One nice perk: You'll earn the bonus even on award nights, tacit recognition of Hyatt's desperation to earn back the trust of unhappy elites. You can earn a maximum of 25,000 points during the promotion. You must register by March 31 to participate. Best Western has a weak loyalty program, so its primary method of goosing traffic is cash--or cash equivalents. This cycle's promotion: a $10 electronic gift card for every stay until April 29. You have to register in advance, of course, and be a member of Best Western Reward, that weak frequency plan. And if this sounds familiar, it's because Best Western ran the same $10-per-stay deal this past winter. Information: LIMITED TIME OFFER page. Wyndham, a sprawling and mostly mediocre group of hotel chains, has a unique frequency program. Wyndham Rewards prices all free nights at 15,000 points. That means the good (Wyndham, Dolce, Tryp) and the garbage (Days Inn, Howard Johnson, Ramada, Travelodge) cost the same per night regardless of quality. To goose new travelers to join Wyndham Rewards, the group is offering 15,000 bonus points after two stays at any Wyndham property. There are a few caveats, of course: You have to be a member of the program, must register in advance and complete your qualifying stays by July 1. Information: the YOUR KEY TO A FREE NIGHT page. If you suspect hotel frequent stay programs are going the way of frequent flyer programs, well, consider the dull and underwhelming first-quarter deals being flogged by Hilton and the two-headed Marriott/Starwood combine. Hilton, for example, is offering a bonus of just 2,000 points per stay, a fraction of what it offered last year. The promotion runs from January 1 to April 30 if you register in advance. Meanwhile, Starwood Preferred Guest offers only double points per stay--and only starting with the second stay. There's an additional small bonus of 500 points if a weekend night is involved. The January 16 to April 15 offer requires advance registration. Not all Starwood properties participate. Marriott also makes you wait for the second stay during the January 16 to April 15 promotional period. Its offer is 2,000 points per stay with an extra 1,000 points for weekend periods. And, yes, you must register in advance. When you affect luxury--as Hilton's Waldorf and Hilton brands do--rate cutting is frowned upon. Doesn't mean it doesn't happen, of course, but it is frowned upon nevertheless. The preferred method of lowering the price is by gimmicks. The current gimmick? A $50 statement credit for each night you spend in participating Waldorf and Conrad hotels. Three-day advance reservations are required and there are blackout dates. And as I always say with deals like this, always check to see whether a cheaper rate is available than the promoted gimmick. A two-night minimum stay is required. All Waldorf properties honor the promotion and 27 Conrad properties are participating. Waldorf is calling its $50-a-day BEST OF WALDORF. The Conrad promotion is called COMPLIMENTS OF CONRAD. Hainan Airlines, the flagship carrier of the sprawling, if opaque, HNA empire, has pioneered nonstop flights to China's heartland and "secondary" cities. It takes time to train Americans to travel beyond Beijing and Shanghai, so Hainan continues to offer shockingly low fares on its well-regarded business class. From Los Angeles, for example, it's just $1,964 roundtrip to Chongqing, Chengdu or Changsha, capital of Hunan province. From New York/JFK, it's just $2,490 roundtrip to Chengdu (capital of Sichuan Province) or Chongqing, a metropolitan area of 30 million people. At those prices, you can fly just to eat Sichuan or Hunan cooking for days at a time. There are also sub-$3,000 roundtrip fares from Chicago, Boston or Seattle to Beijing and Shanghai. Valid travel dates vary, but I wouldn't tarry at these prices. Information: the Hainan OFFERS page. This would normally be about the time La Compagnie would run a sale on its Newark-Paris flights. The fare would usually be $1,400 roundtrip. This time there's a twist, however. La Compagnie is moving its Paris base to Orly Airport from its current perch at Charles DeGaulle. So the $1,400 roundtrip fare is available on select dates after April 23, when La Compagnie starts Orly operations. Tickets must be purchased by March 22. Information: the La Compagnie WELCOME TO PARIS ORLY page. Deals to Africa are hard to come by. But along comes KLM with simply insane pricing--albeit in coach. How about Atlanta to Marrakech for as little as $841 roundtrip? Or New York to Algiers for $720 roundtrip? Or Los Angeles to Nairobi for $816 roundtrip? Or even Washington to Johannesburg for as little as $902 roundtrip. The prices aren't come-ons, either. KLM has a handy-dandy bar graph showing you when the fares are available and there seems to be substantial availability. Almost all itineraries include a stop in Amsterdam, but that shouldn't surprise you. Restrictions are minimal, too, requiring only a 7-day and Sunday-night stay. Information: KLM EXPLORE AFRICA TODAY page. No international airline serving the United States has a more interesting--okay, totally bizarre--route network than Singapore Airlines. With its Singapore hub difficult to reach, and management apathetic to the need for U.S. nonstops, Singapore Airlines has settled for so-called fifth freedom nonstops to other cities. The result: Singapore has to discount to keep those "secret flights" filled. Which explains why you can fly its excellent business class nonstop from New York/Kennedy to Frankfurt for as little as $2,369 roundtrip. Nonstops from Los Angeles to Tokyo and Seoul are selling for as low as $3,530 and $3,430 roundtrip respectively. Restrictions are minimal and fares are valid for departures until March 31. One other note: Singapore Air now flies nonstop to Changi from San Francisco (16.5 hours in the air) with new Airbus A350 aircraft. The carrier is also discounting that route with a $4,243 roundtrip business class fare. It's available for midweek travel until December 31 with a 21-day advance purchase. Information: the BUSINESS CLASS FARE DEALS page. British Airways isn't only hacking away at the quality of its in-flight product and its reputation as a premium carrier. It's also reducing the classic deals you can use to get discounts. Take its long-standing AARP deal. BA once offered as much as $400 off roundtrip. Now first and premium class discounts have been jettisoned and we're left with $200 roundtrip off BA's outdated business class and $65 off its newly "densified" coach class. Also gone: the opportunity to twin the AARP discount with other BA promotions. Still, $65 or $200 off is better than a stick upside your head. And the current deal is now valid for travel until the end of 2019 when you book by January 31, 2019. The cost of entry: the $12 fee required to join AARP. And you must enter through the AARP portal to score the discounts. Information: the EXCLUSIVE AARP MEMBERS page. Finland remains what it has always been: a middle ground between Europe and Russia. And Vantaa Airport in Helsinki remains what it always has been: a fabulous place to change planes en route to Russia. See where I'm going with this? Finnair is offering great deals in business class over its Helsinki hub to Russia. Prices are valid for travel until well into next summer if you can hit the admittedly stiff (60-day) advance-purchase restriction. Sample fares: Yekaterinburg for $2,275 roundtrip; Moscow for $2,290; and St. Petersburg for $2,295. Oddly, if you're actually headed to Helsinki, the nonstop roundtrip price is $2,685. Information: the Finnair FLIGHT OFFERS page. In the early days of transatlantic jet travel, free "stopovers" in the country of arrival were a standard perk. Now the practice has virtually disappeared and airlines will charge you separately if you don't make your onward connection within hours of your transatlantic arrival. But TAP Air Portugal, revitalized under the leadership of a consortium fronted by JetBlue Airways founder David Neeleman, has brought the perk back. Last year it revived a free, three-day stopover in Portugal as part of roundtrip, transatlantic nonstops to Lisbon and Porto. Beginning with travel in September, however, stopover privileges will be extended to five days. There are also other perks attached to the stopover, including hotel discounts, free museum and attraction admissions and free wine with meals. TAP and its partners have even created a "stopover app" to help guide you around the country via smartphone. Information: PORTUGAL STOPOVER page. Amtrak is only useful in the Northeast. And occasionally into Canada. Now we have one of those moments. For the rest of the winter and into early spring, Amtrak is selling weekend roundtrips between New York City and Montreal for as low as $90. The fare is available for maximum five-day stays when using Train 69, The Adirondack, which requires about 11 hours to make the run between New York's Penn Station and Gare Centrale in Montreal. It makes about a dozen intermediate stops. You can travel Thursday through Monday until April 26 if you book by April 23. Information: the ADIRONDACK WEEKEND GETAWAY page. NATIONAL/SOUTHWEST: Quadruple Rapid Rewards Points for Weekly Rentals. Again. Southwest Airlines and National Car Rental have teamed up to offer a bigger payoff for rentals if you need a vehicle. Instead of the standard 600 Rapid Rewards points, a two- or three-day National rental will earn 1,200 points. Rentals of 4-6 days will earn 1,800 points. Weekly or longer rentals will score 2,400 points. To score the points, use Contract ID code 5030510. The bonus points are valid on rentals until January 31, 2019, with a one-day advance reservation. By the way, if this sounds familiar, it is exactly the same deal that ran all of last year. Information: the RAPID REWARDS PROMOTIONS page. Government-owned and bureaucratically marketed Amtrak isn't at the pinnacle of promotional activity. Still, its annual version of BOGO (okay, buy three, get one) isn't too bad. If you take six Acela one-way trips (or three roundtrips) by February 28, Amtrak will buy you back a roundtrip (or two one-ways) between July 3 and August 30. It is offering the same buy three (or six), get one (or two) promotion for trips on the slower Northeast Regional runs. You must register for both offers, of course. There are some modest blackout dates on the freebies and minimum-spend rules for the winter purchases. Information: the 1-2-3-FREE page. What do Hertz and United Airlines have in common? Lessee, both operations run poorly. A former top United exec was ousted as Hertz chief executive for doing a lousy job. And United once actually owned Hertz. Other than that? Both are desperate for new customers. The solution: gigantic bonuses for even one-day rentals. Until March 31, book a mid-size or larger Hertz car at United.com and you'll receive a 1,500-mile bonus atop the 500-1,250 miles you'd normally earn as a member of MileagePlus. That means 2,000 to 2,750 miles for rentals as short as a single day. Does this sound familiar? It should. It's a re-introduction and extension of a promotion that the two companies have continually offered for almost two years. By the way, check your MileagePlus account. You may qualify for a promotion that offers up to 5,500 miles per Hertz rental. Information: the EARN AWARD MILES page. Even as it has rocketed to the top of the car-rental heap, Enterprise continues to do things differently. For starters, all of its locations are company owned, astonishing in this era of franchised everything. It has expanded rapidly at airports, but its roots remain in the we'll-pick-you-up local station. And many of those local stations close on Sunday with short hours on Saturday. The result: a ridiculously wonderful promotion that offers cars as low as $9.99 a weekend day, so long as you return the car on Monday. 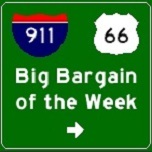 The $9.99 rate covers economy or compact cars. Larger cars are $14.99-$19.99 a day. The rates include 100 miles per day and are valid for rentals that start on Fridays. Best of all, the prices are valid at participating local stations until May 29. You will find some holiday blackouts, but, otherwise, it's open season for cheap cars. Information: the Enterprise $9.99 WEEKEND SPECIAL page. Sometimes the classics are the best and that's certainly true for National's One Two Free promotion. Two rentals of a midsize car by February 28 earn a free rental day that you can use by June 15. As has been the case in recent years, the points-based system offers 300 points per qualifying rental. It takes 600 points for a freebie. And as usual, National has thrown in a few wrinkles to pique your continued interest. You'll get a one-time bonus of 300 points for any size rental in Latin America, the Caribbean or Europe. You'll also receive 300 bonus points for every renter you refer to the Emerald Club. Using National's app for reservations gets you 75 bonus points per rental. This year's most interesting perk: extra points for the third rental. Also notable: If you participated in last year's 12Free promo, any unclaimed points roll over to this year's program. Advance registration and Emerald Club membership are required, of course. Information: the ONETWOFREE page. American Express is hoping there are still some people out there who value Delta SkyMiles. Hence the revived offer for 70,000 miles if you take the Delta Platinum American Express card. You'll score the acquisition bonus (and 10,000 Medallion Qualification Miles, too) when you spend $3,000 on the card in the first three months. The card's annual fee is $195, but it is offset by a $100 statement credit when you charge a Delta purchase to the card in the first three months. You must apply by April 11. Information: the REACH STATUS FASTER page. As I mentioned at the beginning of the year, Marriott/SPG is now working with both Chase and American Express to create a new portfolio of credit cards. Which means you should jump on any deal that comes along on existing cards. And right on schedule comes a 75,000-point acquisition bonus for a Marriott Rewards Premier Card. Best of all, no annual fee during the first year. So the only requirement is the modest $3,000 spending requirement during the first three months you hold the card. Seems like a quick and painless way to score Marriott points for free while you wait for those new cards. Information: the MARRIOTT REWARDS PREMIER page. As the airline frequent flyer programs get less generous, smart travelers are banking their miles with banks. Chase Ultimate Rewards points, for example, offer a 1:1 transfer to United, Southwest, several international airlines and some hotel chains, too. There seems to be less risk by banking points with Chase and moving them to your programs as the good deals--or award availability--warrant. One of the current stars in the wide Chase portfolio? The Ink Business Preferred Card. For the $95 annual fee, you'll receive an acquisition bonus of 80,000 points when you spend $5,000 during the first three months. You'll also earn three points per dollar spent on travel expenditures; shipping charges; payments for Internet, cable and phone services; and certain advertising purchases. Information: the 80,000 BONUS POINTS page.